A report on Mobile Learning at Work by Towards Maturity revealed that 47% of businesses and other organizations already use some sort of mobile devices for training and eLearning activities. With the mobile learning market reaching approximately $8.7 billion in 2015 and showing promise to reach $12.2 billion by 2017, clearly mobile learning is becoming increasingly popular in the online learning ecosystem. So, how do you approach effective mobile learning? There are various different ways; in this article, we cover 7 key dos and don’ts of mobile learning you need to pay attention to. Why are you creating a mobile learning module? In mobile learning “context is king”. So the first thing that needs to be done when developing a mobile learning program is to identify and understand the context. Is it learning or performance support that you want to provide? What is the goal of the program? Is it the core program or a support module? Once the context is set by identifying the demographic and the goals that need to be achieved, you can start developing your mobile learning program. Follow the KISS (Keep It Simple Silly) methodology when you want to develop a great mobile learning program, especially when it comes to the navigation. The user interface has to be simple and easy to navigate. The user should ideally be able to navigate the learning material with one thumb or two thumbs at the most. Instructional Designers have to bear in mind that as the screen size reduces navigation becomes harder as compared to a desktop. So creating proportional layouts and sizable buttons play an important role in creating a great mobile learning course. Additionally, learning providers also need to ensure that they keep the content easily searchable. This can be done by using obvious titles and making sure the menu is simple to navigate. 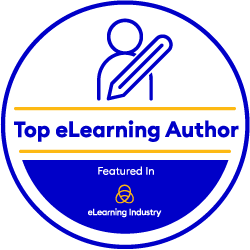 Yes, there has to be a certain amount of scrolling in every mLearning course, but a great mLearning course will keep the scrolling to a minimum. Ensure that the content created for the module does not exceed three scroll length. In the case of a longer module, it makes sense to break up the content into different screens with an identifiable “next” button. Learning providers also have to ensure that they minimize distractions on the screen. For this, they need to keep the low-relevance items such as legal information, copyright notices, or other links that are not key to that module at the bottom of the screen. With mobile, everything has to be crisp… even the information. Content in mobile learning has to be bite-sized and segmented keeping in mind memory limitations, battery life, and short attention spans. Having a clear content plan at the beginning of each module helps in making the objectives of the course clear. It also sets the expectation of the learner. Furthermore, you need to consider the overall file size of the course. This will help you make sure it does not compromise the storage capacity of the device, can be easily downloaded, and can be used in both offline and online modes. Small, bite-sized nuggets of information become easier to view, consume, and process, which in turn contribute to the effectiveness of the learning program. Multimedia elements immediately improve the effectiveness of any learning program and mobile learning is no different to this. However, it is essential to first analyze your target demographic. Then, you need to use only those multimedia elements that will enhance the effectiveness of the program. For example, using video in mobile learning is great, but you need to make sure that the video is not media heavy or too long as that might compromise its consumption. With mobile learning, multimedia should be used to highlight important elements to facilitate information retention and reduce the cognitive load. Mobile learning programs have to adopt the “receiver” mode rather than the “push” mode. So, the course has to be designed such that it is personalized, the users can self-diagnose what they want to achieve, set their learning pace, and get support when they need it. Instructional Designers creating mobile learning courses thus have to ensure that they create modules that the learners “interact” with. They also need to ensure that they provide the right back-end support to guide and help the learners. While creating these interactions, it is also essential now to include the social angle. Employing game-based learning strategies for assessments and tasks, providing the learners the opportunity to share their results on social media platforms, or enabling the use of social media platforms for discussions etc. also contribute to the success of a mobile learning module. This is an absolute no-brainer: When developing a course for mobile learning, making it responsive is not an option anymore. You also need to consider both landscape and portrait orientation when designing for mobile. Using technology such as HTML5 that is mobile friendly also helps in making mobile learning modules versatile, robust, faster, and responsive. As the workforce continues to become increasingly mobile and the millennial generation takes center stage, learning providers need to create mobile learning programs that are engaging and immersive to facilitate better learning. With mobile learning, less is more. Here, with these 7 key dos and don’ts of mobile learning, we look at more granular designs, instructional solidarity, and above all an easy and satisfying user experience.